The latest Google Pixel 3 feature is a a photographers' dream. It was a feature that Google teased at the launch of the Google Pixel 3 and Google Pixel 3 XL but now Night Sight is coming to all Pixel phones and Digital Camera World were among the first people to try out this new, and pretty revolutionary camera feature. Google has bet big on smartphones this year, and most importantly, the camera side of things. If you take one look at the hardware, this would be surprising as what you have on the Google Pixel 3 and Google Pixel 3XL is just one lens on the back. We are now in a world when one lens feels rather inadequate - you just have to look at the three-lens setup on the Huawei Mate 20 Pro to understand where manufacturers are going with cameras on phones. But Google has done something pretty miraculous - it's used software and AI to create a number of innovative features for the Pixel camera. The first of these was its Super-zoom Lens technology. If you want to learn more about this, then Google produced a geeky, in-depth blog about how the zooming worked. And now there is Night Sight, a feature that completely enhances night-time photography, mimicking long exposures through its AI-enhanced software. "Night Sight constantly adapts to you and the environment, whether you’re holding Pixel or propping it on a steady surface. Before you press the shutter button, Night Sight measures your natural hand shake, as well as how much motion is in the scene," notes Google about the feature. So, that's how it works but how does this correlate to a real-life test? Well, we have been playing with Night Sight on the Google Pixel 3 for a little while now and are impressed with the results. Google has made sure that Night Sight isn't an overlay on your photos like an Instagram filter, more an enhancement of the available light available which makes for a much purer, nuanced night image. Take, for example, this shot of the London Eye. We shot it in the normal camera mode to begin with. Google seems to have really thought about all aspects of night shooting. In another geeky, in-depth blog it speaks about how it is actually using the camera's Super Zoom functionality to help with its Night Sight functionality. "On Pixel 3 we use Super Res Zoom, similarly re-tuned, whether you zoom or not. While the latter was developed for super-resolution, it also works to reduce noise, since it averages multiple images together," explains Google. "Super Res Zoom produces better results for some nighttime scenes than HDR+, but it requires the faster processor of the Pixel 3. "By the way, all of this happens on the phone in a few seconds. If you're quick about tapping on the icon that brings you to the filmstrip (wait until the capture is complete! ), you can watch your picture "develop" as HDR+ or Super Res Zoom completes its work." Another of our shots was of the side of the Houses of Parliament. This shot was a little more subtle than what was seen on the London Eye, but there's certainly more brightness in the detail of the far windows of the building and more clarity in the scaffolding-clad Big Ben clock tower. Again, though, the Pixel 3 does a decent job of this scene without the Night Sight on. All of the above are photos taken with a lot of available light. Where the Night Sight really impresses is when there's hardly any light at all. This isn't a night vision mode, but the photos you can get from seemingly dark and gloomy spaces is really impressive. The selfie below was taken with not much light around, just a little bit from a street lamp in the background. When you add Night Sight, the whole image is brightened but not unnaturally so. Yes, there is detail lost a little in the face, but the comparison here is really good. Another shot that shows off Night Sight is that of the hedgerow. The non Night Sight shot is almost in complete darkness, but with Night Sight switched on you can see the nice autumnal mix of green and brown leaves. Whatever wizardry Google has used to make Night Sight, it has our full recommendation. This is a serious addition to the Google Pixel camera - a feature that can seemingly turn the darkest of shots into light-filled masterpieces. Yes, it's using AI and algorithms, but when the quality of the shots are this good, we aren't going to argue. 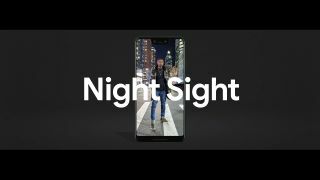 Night Sight mode will be available as an update to all Google Pixel phones in a matter of days. Huawei Mate 20 Pro vs Google Pixel 3 XL: which boasts the best camera?